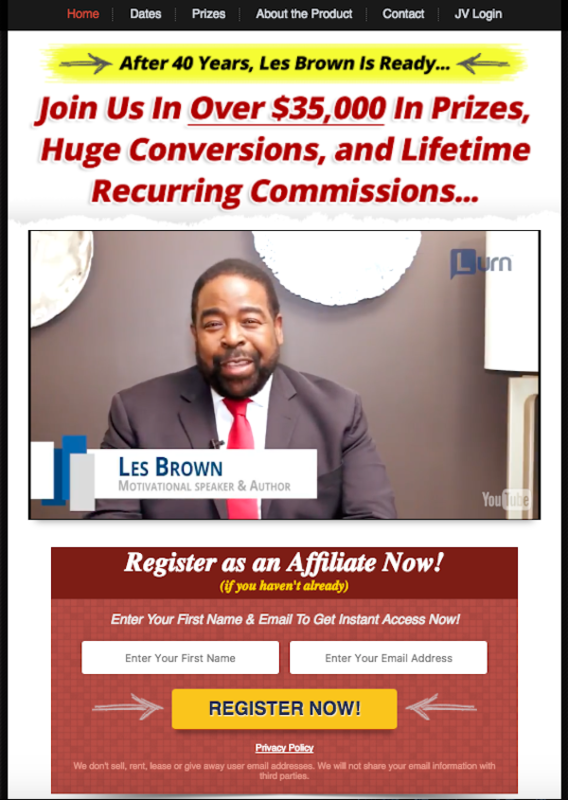 Les Brown – Laws of Success Launch Affiliate Program JV Invite, More. Welcome to the JVNP 2.0 Update featuring a JV request courtesy of fellow JVNP 2.0 Partner Les Brown (Laws of Success personal development launch affiliate program JV invite), Buzz Builders (Jo Han Mok – Add-To-Cart University newly released evergreen affiliate program), and More … in Today’s earn more with Les edition. Happy Passover, Holy Thursday, Good Friday +/or Easter … whether you celebrate any or all of them, or not! Fellow JVNP 2.0 Partner, what do you get when you take a legend of our time, best selling author, speaker, coach, and downright super star Les Brown, and put him together with the Lurn Team? You get one EPIC launch! Les Brown, one of the most influential personal development personalities of our time is having a launch, and we want you to be part of it. 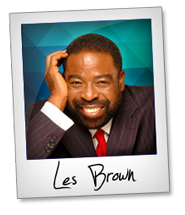 As one of the world’s most renowned motivational speakers of a generation, Les Brown is a dynamic personality and highly-sought-after resource in business and professional circles for Fortune 500 CEOs, small business owners, non-profit and community leaders from all sectors of society looking to expand opportunity. From all of this, Les has distilled 12 distinct fundamental laws, that once mastered, will put anybody on the path to success. THAT is what this book is all about! The goal here isn’t just to have another “feel good ” read, but to handover specific step by step action plans that you can see results from – the day you start! Goal #1: Step-By-Step Blueprint To Help You Boost Your Wealth & Cash Flow. Goal #2: 100% Re-Wire Your Mind To Instantly Start Attracting The Right People & Opportunities Into Your Life! Goal #3: The Quickest Laws That Not Only Increase Your Wealth, But Also Your Happiness & Fulfillment From Life! We’ve been testing and tweaking this funnel for months, and it’s converting like gangbusters, plus, we’ve got over $35,000 in prizes to be won, both for leads and for sales. We THANK YOU for your support and can’t wait to provide your customers with MASSIVE value and fill your pockets with TONS of Money! JV with the “Asian Godfather of Digital Marketing”! Fast Company Magazine has dubbed Greig “The Nation’s Leading Search Optimization Expert on LinkedIn”! Make up to $94 commission/buyer + $6,250 cash prizes with LinkedLoot from Greig Wells & Pat Flanagan! Buyers get Greig’s new LinkedIn monetization course (recurring income in 48 hours) + live training. Targeted buyer niches: social media, offline, MMO. Full information and affiliate link request at our JV page => Greig Wells + Pat Flanagan – LinkedLoot JV page. Attention: Anthony is Using Brand New CRM Software for this Launch => Please Register as an Affiliate in the New System! We’ve Cracked the Code to Getting Fan Pages to go Viral … The Biggest Launch of my Marketing Career! HUGE Commissions ($798.80 Per Sale)! $50K Sales Contest – $20K Leads Contest – $100K in Total Launch Contest Prizes! Anthony Morrison’s Affiliate Registration Page link. Your Invite into what is Sure to be one of the Biggest Launches of 2017! In the Zero to Multi-Millionaire web class, Harv shares his 6 proven principles that make the difference between getting rich and staying middle class or broke. And we’ll be offering our highest converting product… Million Dollar Business Secrets, which is converting at an average of $2.13 EPC, but we’re expecting that number to be much higher for our launch. T Harv Eker – Harv Eker International – Zero To Multi-Millionaire affiliate registration. Over 13 years in the business + $100MM+ worth of products sold online = a Team you’ll want to JV with! Give your list a break from high ticket and do some good Lurn Insider has all the tools, know how and support required to build a successful affiliate marketing business and grow it. Up to $300 commission per sale … PLUS lifetime recurring commission! Over $50K in launch time JV Prizes >>> including a Ford Mustang! Anik Singal – Lurn Insider JV page. JV with Traffic Master & Super Affiliate, Jeff Johnson! $50K in bonus cash and prizes up for grabs, 25k for top Affiliate! All-New Tube Traffic Secrets™ 2017 Edition. Bestselling product with refunds below 10%. Last launch 6.67% VSL conversions, avg. EPC $8.42 up to over $20. Earn 40% on TTS. Plus, commissions on upsells, backend sales and recurring commissions. Steven Alvey and other fellow JVNotifyPro 2.0 partners are waiting in the wings … keep your eyes on your Inbox, and follow the action in the JVNP 2.0 Premium VIP JV Announcement archives. Posted in Joint Venture Announcements, Self Help	| Tagged Add-To-Cart University, Affiliate Marketing, Affiliate Program, Affiliate Program Directory, Affiliate Programs, Attract Affiliates, Attract JV Partners, Best JV Brokers, Buzz Builders, evergreen affiliate program, Find Affiliates, Find JV Partners, Home Business, Internet Marketing, Jo Han Mok, Joint Venture Blogs, Joint Venture Forums, Joint Ventures, JV Announcements, JV Blogs, JV Forums, JV Invite, JV Launch Calendar, JV Product Launch Calendar, JVNewsWatch, JVNotifyPro, Launch, Laws of Success, Les Brown, Lurn, Make Money Online, Marketing, Mike Merz Sr, New Product Launches, newly released, Niche Marketing, Online Business, Personal Development, Product Launch Calendar, Work At Home	| Comments Off on Les Brown – Laws of Success Launch Affiliate Program JV Invite, More.